In the nation’s 100 largest metros, 14.7 percent of households have less bedrooms than family members. Los Angeles renters and homeowners are feeling the most claustrophobic, with a 29.2 percent space crunch. L.A. also ranks as the sixth highest metro for households with three or more generations – a trend referred to as the sandwich generation. Taller high-rises, more compact row houses and homes with yards the size of a bathroom are a few trends Americans have been witnessing as living space becomes tighter. In fact, Trulia found that in the nation’s 100 largest metros, 14.7 percent of households actually had less bedrooms than family members. Americans are now living in what has been dubbed the bunk bed generation, where room sharing has become the norm. A combination of several factors can attest to why household members are consolidating their living arrangements. Too close for comfort in L.A.
After comparing top metropolitan areas, one particular city’s space crunch clearly surpasses the rest, causing a large percentage of residents to live just a little too close. While most would assume New York City or San Francisco takes the lead, the numbers tell a different story: Los Angeles renters and homeowners are feeling the most claustrophobic, with a 29.2 percent space crunch. Residents who own a home in L.A. are experiencing the highest level of space crunch nationwide, at 15.9 percent. Comparatively, in L.A.’s neighbor to the south, Anaheim, less than 10 percent of homes lack sufficient room. Bakersfield is second, at 14.3 percent. Residents renting in L.A. are actually experiencing the same problem, but in a heightened degree. It is estimated that 41.8 percent of LA renters live in a space crunched household, which eclipses any other major metro area in California as well as across the country. Only 35.8 percent of NYC renters and 33.5 percent of San Francisco renters are experiencing space crunch. 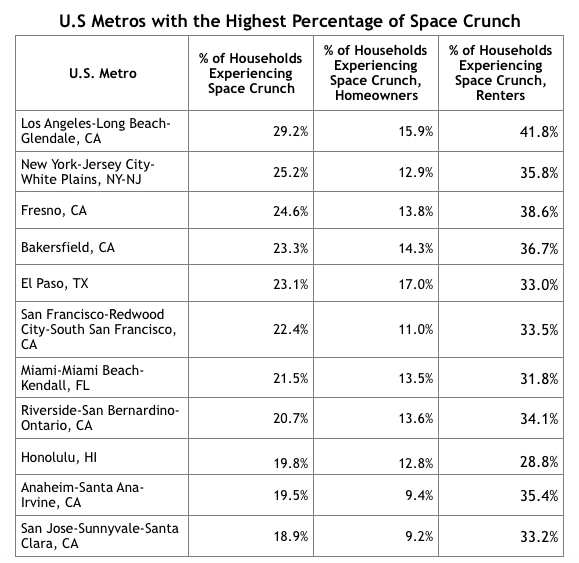 In California, specifically, the next metropolitan that compares to L.A. is Fresno, which trails L.A. by 5.2 percentage points with space crunch at 38.6 percent of renters. Why so little space in L.A.? Those living in L.A. are experiencing this severe space crunch for several reasons: First and foremost, L.A. ranks as the sixth highest metro for households with three or more generations — a trend referred to as the sandwich generation. When looking at one nuclear family, this means that grandparents, parents, and children are compacted into one home. Additionally, graduates are moving back home post-college in attempt to save money. 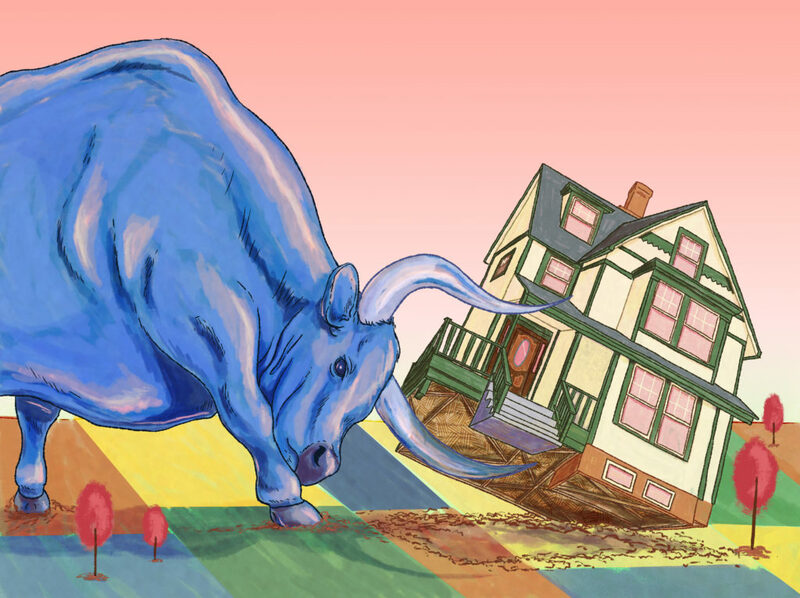 Plus, real estate prices continue to climb, with less affordable housing available in Los Angeles, another major contributor to family household consolidation.